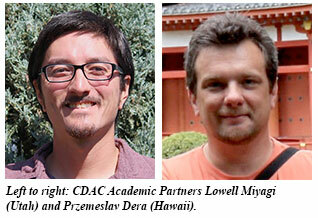 CDAC Partners Przemeslav Dera (University of Hawai'i) and Lowell Miyagi (University of Utah) have been named as the speakers for the 2014-2015 COMPRES Distinguished Lecture series in the field of Mineral Physics. The talks feature topics that emphasize the exciting high-pressure geoscience research being conducted within the COMPRES community and its significance for understanding fundamental Earth and planetary processes. The Series was started in 2008. Since its inception, seven CDAC Partners and CDAC supported post-docs have been lecturers. For more information on the Distinguished Lecturer Series and descriptions of this year’s talks, please follow this link.